Recently, I put together a few different techniques to help myself practice drawing portraits, even though I have a nasty cold and no one wanted to be near me, much less sit for me while I drew them. So I used multiple single-line blind contour drawings and the television to help be get some scribbling practice into my sketchbook. I have done a few more blind contour scribbles in the last few days to help myself warm up before I do something more "serious" in my sketchbook. The funny thing is, often I kind of like the weirdness of the blind contours better than the slower sketch! On the other hand, the blind contours always warm up my hand-eye coordination and help me do a better scribble of anything, no matter what I'm working on. The other evening I decided to give it a try using two television personalities. 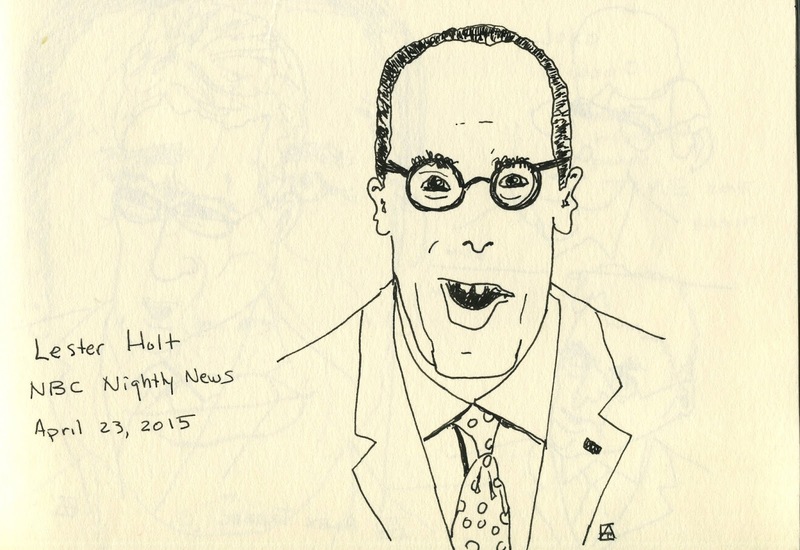 First, Lester Holt, the anchor on the NBC Nightly News. These are single line contours for the most part. In other words, I drew them with my eyes glued to the TV, and without lifting my pen. You can see how some sections of the face stay together pretty well, but once your hand loses its spot, well that's when things go wonky! On the left scribble above, I really like how the glasses moth and chin stick together, but the nose is all on its own there in the middle. And the eyes--how did they wind up so far to the left? You really learn a lot about how your brain receives information from your eyes and transfers it to your hands by doing these. Look at the upper right: where is the man's chin? I don't know. To me, perhaps the most amazing thing about this exercise is how you can look at the same person or picture and do several blind contours one right after another only to have them turn out so completely differently! I think this happens in part because I challenge myself to start from a different place each time. I'm rather pleased with this as it sort of looks like him! So, to summarize, here are the steps I used for practicing drawing people using multiple single-line blind contours and--when no one else is around to sit for you--TV personalities! 1. Find someone to sit for you. Or choose a TV show (like the news) where the people sit fairly still. If you have a DVR and want to freeze the screen, I would not consider that cheating! 4. Look at the paper and select where you are going to start the drawing. Put the pen down. Do not pick it up again! 7. Pick a new point on the person's face to start your next drawing... and repeat. 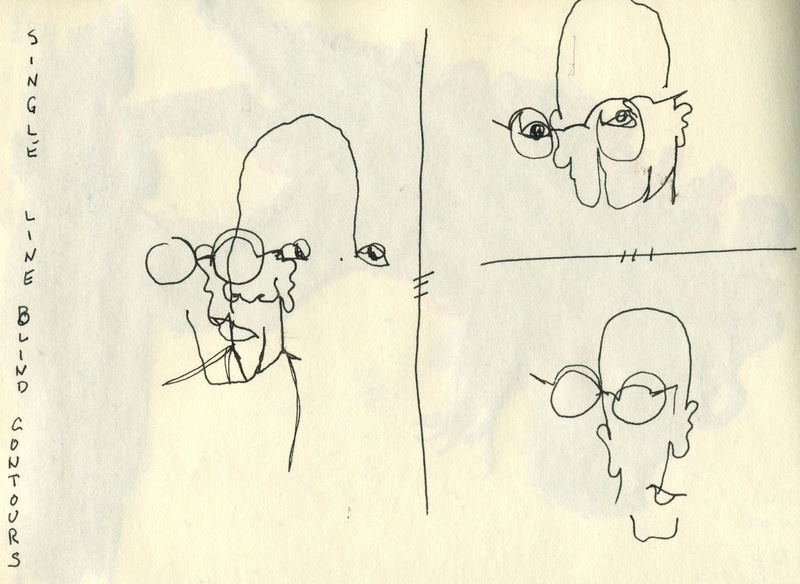 Try to do three or more of these single-line blind contour drawings in a row of the same subject.